La Paz; one dark dinghy ride that night and the city shoreline xmas morning as we motored out. Chris took the wheel and threaded the buoy trail out of town. Rounding the entrance buoy an hour later we hoisted sails and struck out in a northerly direction. The last week with Ezrah we were boarded at this same location by a very nice young man from the Mexican Navy ( they always carry machine guns) who checked our papers and inventoried our safety gear. He boarded us with a leap, the two boats never touching. He exited with another spirited leap from our side deck to their small boat’s bow deck, landing on all fours and generating a round of applause from our crew. The soldiers had trouble suppressing their grins at our compliment on their lieutenant’s agility. Soon we were out in the bay and experiencing the full force of a strong northerly and the wind rotated right around on the nose. We tried tacking back and forth but for every half hour tack we made only about 500 yards progress. A quick computation predicted an arrival time at Bahia San Gabriel at about midnight so we furled the head sail, fought the main sail down, and cranked up the powerful Mr. Perkins. Over the next three hours we all turned green as Chris steadfastly powered us into the blocky waves arriving exhausted in San Gabriel bay before a wonderful sunset. Forgetting to bring in the fishing line, I backed over the line and lost our second to last lure. Then I had to don a wet suit and get over the side to inspect the prop to see if the missing line and lure were wrapped around the assembly. Thankfully there was no line fouling the prop and I was able to clean a few critters out of the waterline through-hull fittings and get back aboard without incident. An exhausting day but a wonderful anchorage at a good jumping off point for our next day trip south. 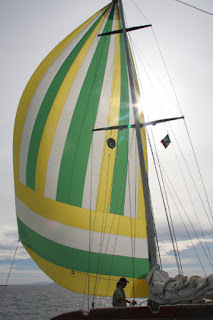 Wednesday we threaded our way south through the hazardous San Lorenzo channel then caught a rising northerly wind with the lightweight nylon gennaker. Traveling at hull speed we raced with the sailboat Bella Via as she attempted and then finally succeeded in passing us with her lovely lateen sails flying. A wonderful sail it was that day to the secure anchorage of Los Muertos. 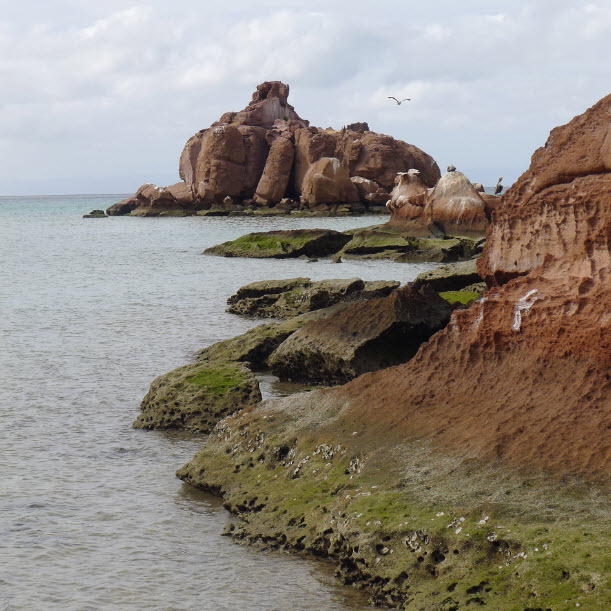 Thursday we motored out at dawn through a calm sea, and continued south in that glassy water all day with the motor roaring, boring us to tears and shaking us to the bone as Bella Via caught up to us again and left us in her dust, so to speak. 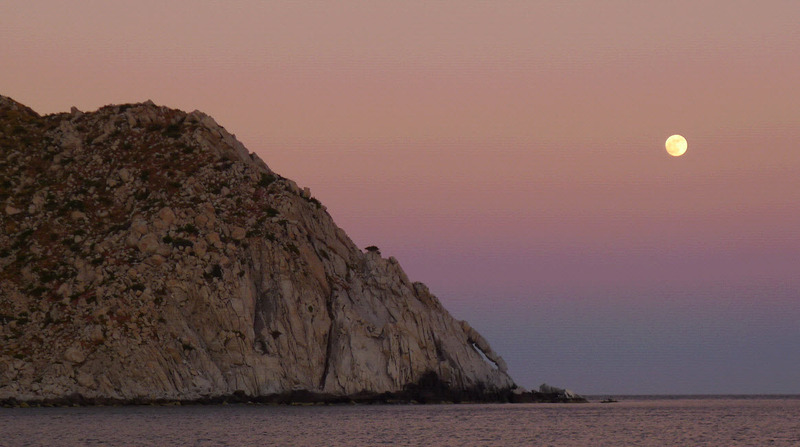 The anchorage at Los Frailes is the eastern-most point on the East Cape of southern Baja and is the closest jumping off point for the transit across to Mazatlan. As we headed in, we drew up close to Bella Via and spoke her captain and crew asking about predicted weather for the next couple of days. We anchored and an hour later the skipper from Bella Via rowed over and delivered a better wind report for the next day’s crossing to Mazatlan, a very nice and unexpected gesture. Armed with this knowledge we took to the beds ready for an early morning departure. Three O’clock in the morning found us up with the diesel running and the anchor coming in on the windlass as the full moon lit the teak decks. Within the next hour we were five miles offshore sailing on a beam reach headed east into building winds toward Mazatlan 160 miles away. We were finally crossing of the Sea of Cortez headed toward the fabled Mexico Riviera. Whales! Off to port. Spouting, breaching, their flukes waving from a distance. The Anchor drops, a full tangerine moon emerges from the sea as a salmon sun sets. We sleep deep. 03:00 arrives too soon, but onward we push. Orion’s belt buckle off our starboard bow, white buffaloes race us to Mazatlan! Crossing the Golfo de California reigning in our bucking Traveler with a “Ready about?” and a “Helm’s a lee” she turns her nose to the wind and we quickly pull in the sheets, cinching them down on the winch. She heels over and surges on. Twelve hours, twenty four hours, thirty six hours, three on , six off, the travelers on Traveler cling to the handholds, shiver in their timbers, as eight foot waves rise up over the lifelines. She is a sturdy boat made for this very active activity. It is we people trying to stay united on our watches who are most challenged. How much further? Can we keep this up? How do we eat this hot soup? Over the sink! Finally, yes finally, land is in sight with only a blinking beacon at first and then silhouetted by a new day dawning are those most majestic mounds, the solid earth. 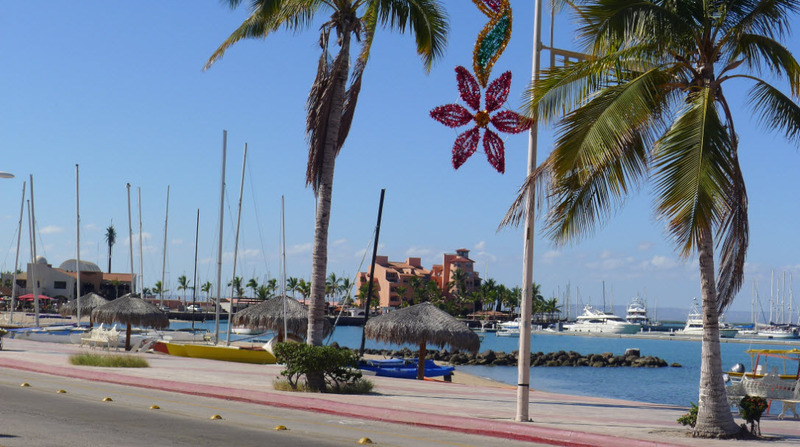 At Marina Mazatlan we are warmly welcomed, throwing our lines to friends old and new. Our stately vessel is becalmed by the dock where she will be well fed and groomed, readied for her next venture into the wild waves. And her crew… a tot of rum for all! Note the Washington Yacht Club burgee below the Mexico flag and above the beer flag. 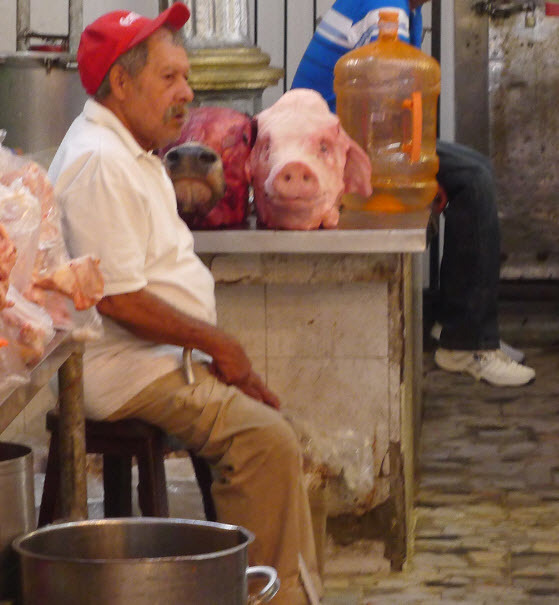 Mercado Mazatlan has something for everyone. 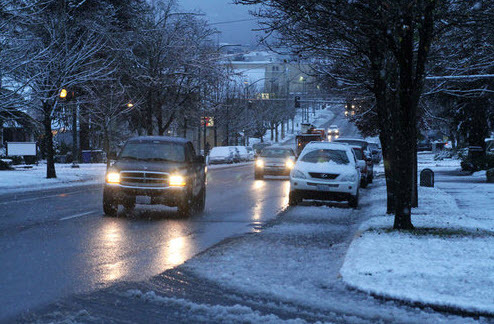 I’ve heard a little grumbling from up north (and some praise, thanks Mary) centered on my last comments on what is, to me, the obvious choice of available climates. Some dissatisfaction has been expressed also on the glowingly positive accounts I normally relate here in this journal. To satisfy those shivering grumblers from the north country I will focus this post on the difficulties of life here in the tropics. Yes we are in the tropics. On the way south from Ensenada between Magdalena Bay and Los Cabos at precisely 23 degrees 26 minutes 16 seconds we passed a line of latitude called the Tropic of Cancer. At summer solstice June 20 if you were standing on the Tropic of Cancer at twelve o’clock noon you could look straight up and see the sun directly overhead. If you moved north of that latitude the sun would never, never be overhead. Likewise if you stood at 23° 26′ 16″ south in the southern latitude and looked upward at the sun on December 21 you would see it directly overhead. This latitude is the Tropic of Capricorn. For those of you lucky enough to find residence up north you will never see the sun directly overhead, never feel direct rays of vitamin D, and in the winter see only a faint hazy orb in the southern sky, weather permitting. What makes the tropics the tropics outside of this ability to have enormous amounts of vitamin D raining down directly on the crown of your head? Bugs. We’ve got bugs. Mr. Roach crawled up my leg in the shower yesterday and no-see-ems or jejenes (pronounced Hay-Hay-Nays) attacked me on the dock last night. Dengue fever is out there is being carried about by voracious mosquitoes and numerous seabirds roost in the rigging targeting your Vitamin D soaked head with their juicy white droppings. It’s warm in the tropics and critters, both big and small, proliferate. We crossed the tropic of Capricorn on the way down the coast, then passed it again as we beat our way up the East Cape to LaPaz. 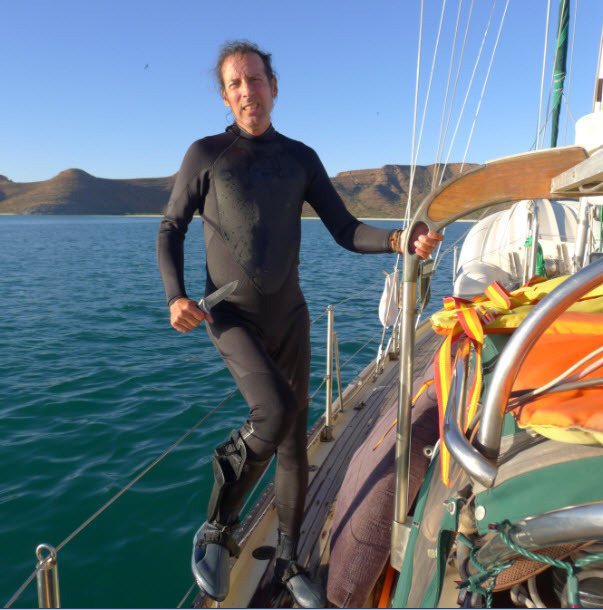 In Lapaz, Connie’s son Ezrah joined us for a week and we visited Isla Espiritu Santo for a couple of nights of quiet anchorages. On the way back into LaPaz we hoisted our large festive gennaker and Ezrah got a chance at the wheel, taking us down the long entrance to the harbor, threading his way between the buoys in the narrow channel. 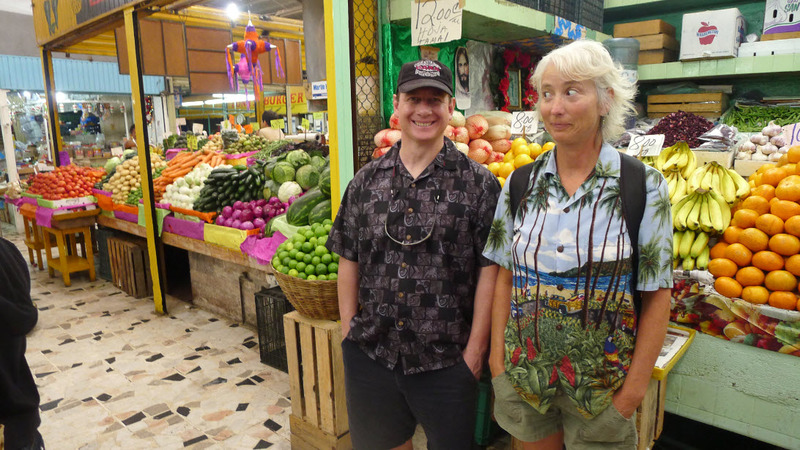 Our friend Chris Simpson arrived to help us take the boat across the Sea of Cortez to Mazatlan. Leaving LaPaz, we rounded the corner and passed the tropic of Capricorn for the third time just north of our jumping off point at Los Frailes. And that’s all you need to know about the Tropic of Cancer and the Tropic of Capricorn, the great delineators of the bug infested, Vitamin D plagued tropics. 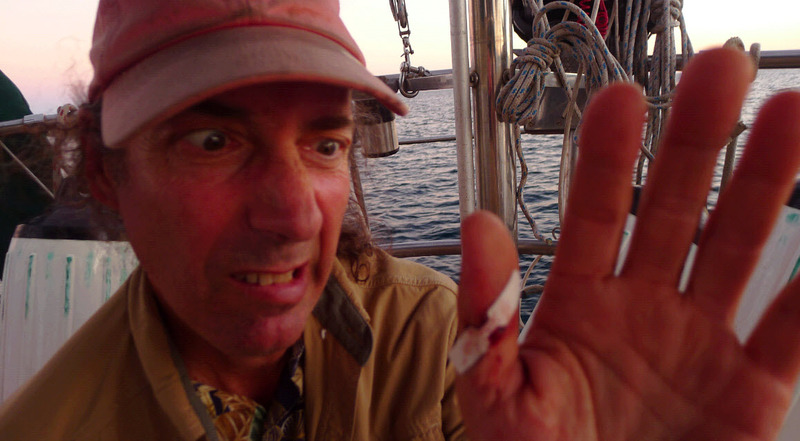 For more on the hardships of life here in the tropics I’ll relate the story of our crossing in the next post..
LaPaz: Baja's whale watching season begins. The truth be told, a few days ago when the pineapple express weather system came through and we experienced a few overcast days here in LaPaz I pined just for a moment for those hazy cool northwest mornings anchored in some Puget Sound bay. Then after a day of sitting inside a damp gloomy boat I welcomed the pacific high again. It is hard to think of snow now. And it is hard to think that we are nearing the winter solstice. 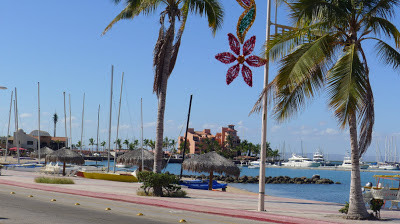 Note the holiday decorations on the LaPaz Malecon in the picture above. The locals are wearing jackets because the days are down in the 70s. Looking at these two scenes, I'm asking myself and I'm asking you: Choose. We are dancing around the harbor in LaPaz. Two steps to the left, one step backwards, then turn around and promenade. First night in we stayed just outside of town at Bahia Falsa. Then we moved on into town the next morning, finding a spot just off the Municipal Pier and the Malecon where everyone walks in the cool of the late afternoon. A few ragtag hippy boats there. We watched one disheveled black hull cutter erupt with eight young men and women clambering around the decks. At 10:00 PM the club opened up its doors ashore and we were entertained till the wee hours with Karoke music of the lowest quality. Can you hit that note? So the next day we moved the boat west, around the other side of the marinas and found a spot where the boats were larger, cleaner, and spaced further apart. Each day the current runs west then east then west then east. All the time the wind blows generally from the north. So the current will point your boat one way and the wind will try to point it the other way. The current usually wins. If a boat drops both a stern and a bow anchor then that boat does not swing along with the others. Sorta like that old guy who is just standing still out there on the dance floor while all the couples dance around him. Watch out! When anchoring, we watch for those old guys who don’t move and calculate our anchor drop and rode length so we won’t swing into him. It’s much better if we all swing together. Up the anchor came again and we moved further out on the fringe of the anchorage, trying twice before we got just the right set. A neighbor came by in his dinghy and asked us why we moved. Getting our answer he said, “Yea, they asked me to move too.” Some folks just need more dance room than others. We hailed our other neighbor on the VHF and asked him if he was comfortable with our position. He came up on deck, looked around, then gave us the thumbs up. Now we were really set. Done. At home. The anchor windless got another workout as we pulled the hook again. The Navy boat then asked our two neighbors to move a little also and I’m sure the young man did this in a very polite manner. You don’t argue with the Mexican Navy so we cruised around looking for another spot. Meanwhile the other two boats were cruising around also. Three 40 something foot cruisers sharking around through a mooring field looking for a home. We found a spot , dropped the anchor, backed down on it and looked right into the windows of a boat just 30 feet away. Not so good. So up the anchor went and we sharked around some more, finally finding a “creative” spot near two boats what seemed to be unoccupied. Down with the hook, let the chain out, back down and watch her swing. That’s it. She’s set. Now let’s sit back and watch the dance for a little while. We had completed our five steps and believed this time that we’d learned the dance. 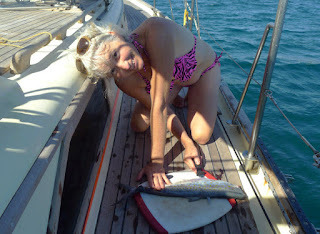 We jumped into the dinghy and drove over to the Marina to visit our friend Marco on Linda Rae. When we came back, Traveler was doing the cha cha with everyone else and she looked like the belle of the ball. First this: If you receive these posts via email, try clicking on the link to take your browser directly to the blog site and read it from there. It looks much better and reads easier than the content in the email. 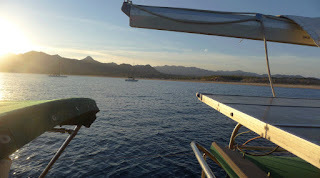 Here we go... After two days of ~bliss~ at the elegant and prosperous marina Puerto Los Cabos we woke early and pointed the bow east as the sun rose off our starboard bow. We raised both the main and the jib, thinking we’d need the big main sail to beat our way north around the East Cape region of southern Baja. Sailing on a beam reach Traveler surged forward attaining 7 knots as she heeled over toward starboard. Down below, items not secured properly started rearranging themselves obeying laws of gravity, momentum, and chaos. The wind died and we were down to 3 knots. 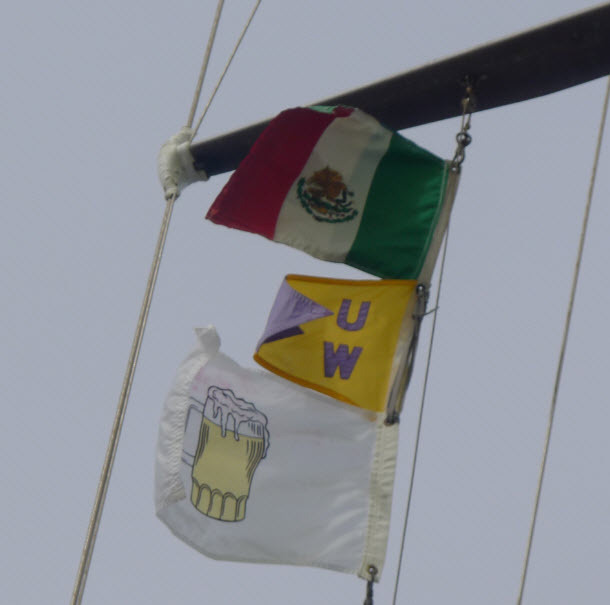 We had our last VHF conversation with Midnight Blue and Chasing the Sun as they headed east across the sea towards Mazatlan. We started beating our way up the East Cape. This region of southern Baja is accessible by a single dirt road so development is limited. Hardy individuals have created their own private sunlit havens up the coast. This area is a favorite for transplanted expatriates/refugees from the U.S. As the sun rose we could see the occasional reflections off glass windows on these little structures dotting the coast line. Back in Cabo we saw gringos on dirt bikes or four wheel drive vehicles making their way into the city for supplies, their vehicles covered in dust. 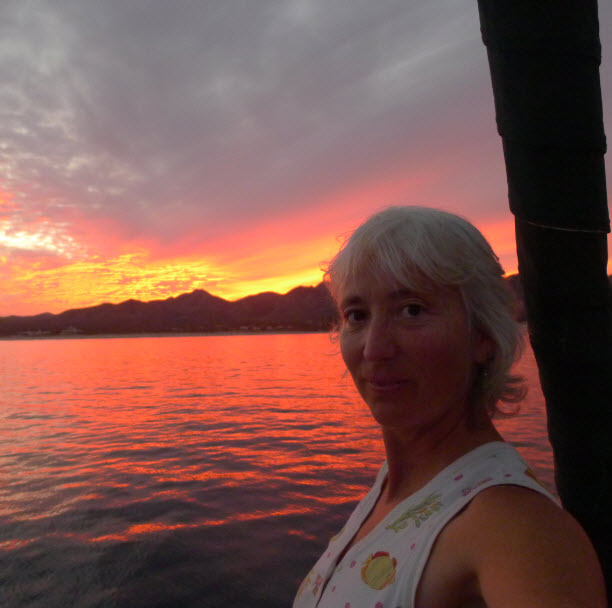 I can see living on the East Cape, watching the sun rise across the Sea of Cortez. Back on the water, the beat north was not getting us anywhere soon. With 30 miles to cover it began to look like we’d not make the anchorage at los Frailes by nightfall. So reluctantly we rolled up the genoa and cranked up the Perkins engine and took the wind and waves directly on the nose. Seven hours later we arrived at the bay and dropped the anchor in 25 feet over a sand bottom. Coming into the anchorage I noted a steel motorsailer that I’d seen in Puerto Los Cabos. These could be the same gringos who kept locking the gate on us; grrrr. Their steel boat rolled to the swell coming around the bend of the bay. They left after we did, bashed their way north under power, and arrived before we did; big engine, diesel power, evil. 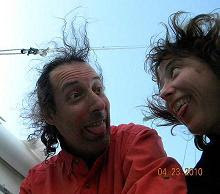 The day for us had been long and the ride was extremely rough with large boulder shaped waves crashing into the bow and spray sweeping the deck. We closed all the port holes and sky lights and hung on tight as water swept over the boat. On Traveler we have side decks with an 8 inch toe rail all around the boat. The water would sluice down the starboard deck then sweep around the stern and meet the other water on the port side. The large diameter scuppers were draining the decks as fast as they could and we stayed relatively dry in the cockpit with only some spray in the face once in a while. 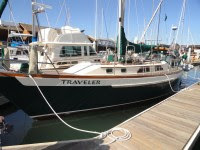 My admiration for the designer of the boat, Stan Huntingford, grew as I saw just how well Traveler handles heavy seas. Los Frailes - Can you spot the Frier climbing up the point of rock? We should have doused the main or at least reefed it but by the time we were into the rough conditions we didn’t want to go up deck to wrestle it down. So I set the boom off to one side and used the main as a steading sail. That evening at Bahia los Frailes we ate quick leftovers and crashed in exhaustion as the moon rose over the headland. The heat of the engine and the presence of the hot water heater under our master berth made it impossible to sleep in the master cabin so Connie took the vee berth and I the settee. Sleeping apart? Oh No! Los Frailes is a protected bay where an anchorage in the north portion blocks the waves and most of the wind that prevails from the north. We stayed the next day, resting and straightening up the boat. On Thursday we poked our way out into the north wind and started beating our way north again, this time with a reefed main. Sailing was possible for an hour or two then it got rough again so we motored for another 8 hours straight into it. The going was very rough again and both of us got tired after holding tight for hours on end. When we approached our next anchorage at los Muertos the wind was high, the seas were steep and it was dark, dark, dark. Using the radar and the GPS we found the anchorage and had to get pretty close in before the wave action allowed us to go on deck. 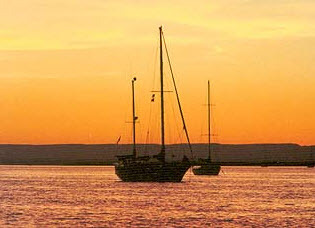 The anchorage held about 5 boats, 3 with anchor lights and 2 without. So we used our powerful spotlight to find a space to anchor, sweeping it back and forth to find the dark silent boats anchored there. Note to cruisers… please put an anchor light on your boat if you are in a destination anchorage where folks will be coming in at night. Being tired, I was not careful enough and the seizing wire on the anchor shackle snagged my thumb as I released the chain. I got a good deep laceration as a thank you for the end of the day. Just before we went to bed, I was on deck peeing in the cup when I saw the ominous shape of a steel motorsailor entering the bay. Again, they anchored a ways off, in the deeper water where they could watch and plot and scheme. Who are these guys and why are they stalking us? Are they upset because I locked them out of the shower and dismantled the gate lock. I set an anchor alarm then went to sleep. On Friday I got on the VHF at 08:00 and hailed anyone in the bay. Anyone came back in the form of Bill and Diane on the beautiful cutter, True Love. I talked at length with Diane mostly about the anchorage and what strategy to use for making our way north. 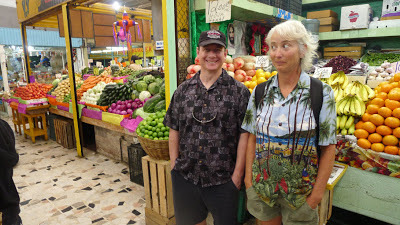 She gave me a weather prediction and lots of good advice about the transit and the ins and outs of La Paz. We spent the day aboard nursing our wounds and doing little boat projects, determined to wait for the Norther to blow itself out. Saturday I worked on the SSB radio and finally figured out that you must plug in the antenna for it to work properly. Then we were able to receive weather forecasts on the Sonrisa net. The Norther was still blowing strong. We inflated two kayaks and went to the beach. Connie and I bought a couple of expensive cold beers, Bohemia chocolate stout, at the little restaurant there while watching the new president of Mexico, muy guapo, on the wide screen TV. We then bought a fish from some fishermen we found at the boat launch just in on their Panga. The fish was a yellow spotted Sierra, the type used when making ceviche, (20 Pesos )and was delicious that evening. On the paddle over, we were hailed by a couple on a 40 foot ketch and invited over for sundowners that afternoon. Because we’d anchored a little ways out from shore we decided to move the boat in a little closer so we up anchored and moved toward the beach setting the hook in 18 feet on a sandy bottom. We drifted down to the ketch “Harmony” in our little kayaks and shared a bottle of wine and some fruit with Virginia and Robert Gleser. Like many people we’ve met, they have been cruising for many years. 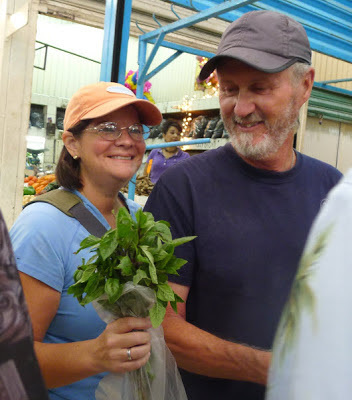 Their lifestyle is to cruise half the year in Mexico then leave the boat on the hard (dry docked) in San Carlos for the summer while they visit and take care of business. Virginia has a book out named “Harmony on the High Seas” which we are now reading. We enjoyed the evening and as I looked south I noticed the dark, steel motorsailor was gone! Maybe the spell is broken and we can now be free from its hulking presence. We paddled north from Harmony finding our anchor light among the rest of the anchorage. The stars overhead were crisp and the wind was light. The next morning I was listening to the weather report and it reversed itself saying that even heavier weather was expected by Tuesday. Making a snap decision we jumped into action and got the anchor up and started motoring around the corner. 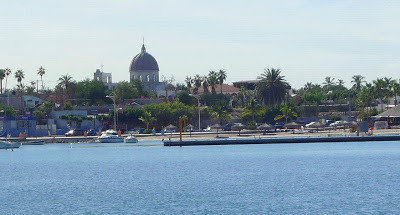 By 09:30 we had passed the infamous point at Arena de Las Ventana where the wind and waves funnel down the coast between the peninsula and the 16 mile long Isla Cerralvo. We cranked up the Perkins and powered north making 6 knots with some help from a favorable current. The seas were fairly calm and we made good time. Using GPS coordinates from the Shawn Breeding and Heather Bansmer guide book we transited the San Lorenzo channel, passing closely by a shoal, a reef, a wreck and a rock. 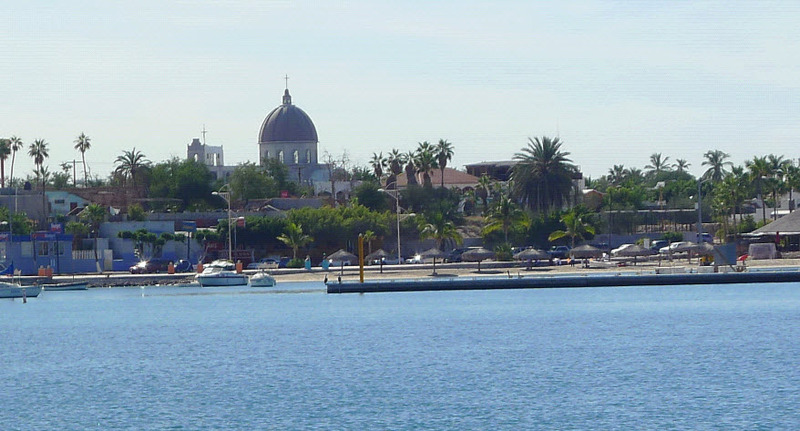 Then we turned south towards La Paz and found a quiet anchorage at Bahia Falsa for some fish tacos and a celebration at arriving at the front door of La Paz. 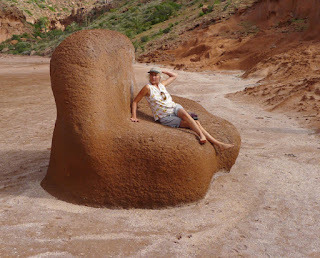 Eighteen days out of Ensenada we completed the first big leg of our winter cruising plans. Now we’re getting ourselves organized and getting ready for a month long stay in the area; more to come.